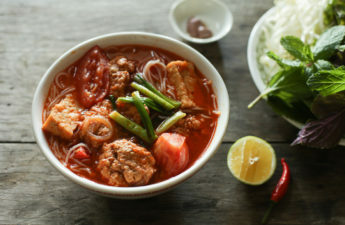 Bánh xèo seems to be designed to be eaten as a family. The batter, filling ingredients, and veggies aren’t complicated to prepare, but they don’t make sense to be bought or made to be eaten by yourself. You don’t just buy 1/4 pound of pork, 8 shrimps, or buy 1/4 head of lettuce. You kind of have to bump the volume to make each step worth the prep and to me, meals that are shared are a lot more fun anyway. These crêpes take a little bit of prep time and organization, then you can just keep knocking these guys out faster than people can eat them. I’ve heard many folks refer to bánh xèo as “that Viet egg thing” and it always took me a while to figure out what they were talking about, until they mention the filling has pork, shrimp, mung bean, bean sprouts and some green onion. 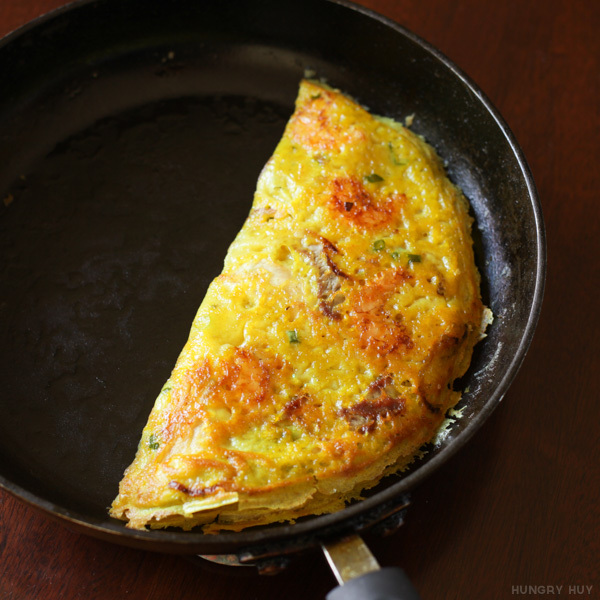 These crêpes are yellow and kinda look like omelettes–but! There are actually no eggs in here. It’s just turmeric powder that colors em yellow! 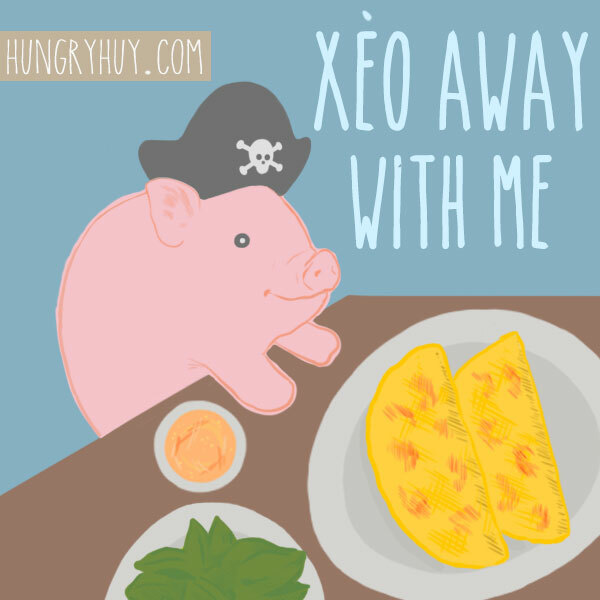 Bánh xèo is food meant to be eaten with your hands. You’ll always find a big plate of greens with a mix of herbs to go with it. 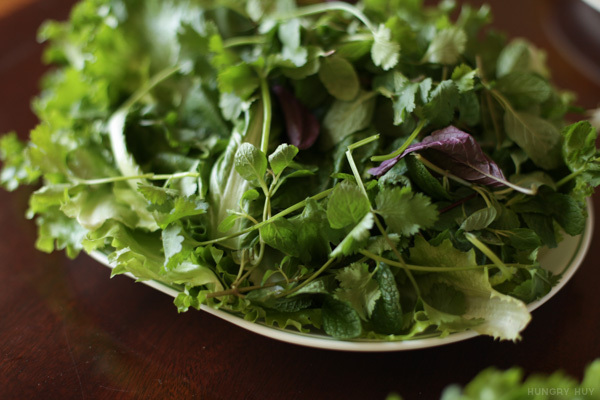 You can substitute green leaf lettuce for the mustard greens in a pinch, and mint is the only must-have herb here with cilantro and Vietnamese perilla being the other commonly used ones. However you can really throw in whatever you like. 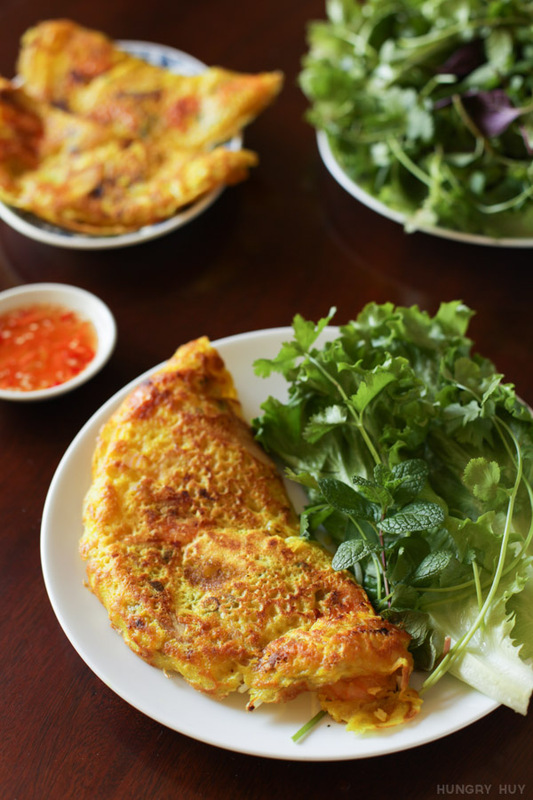 Early versions of bánh xèo were probably made with rice flour without the use of wheat flour. It can work for you too, but using wheat flour helps these fellas develop that nice browning color as it crisps up in the pan. I usually get rice flour pre-made in bags at Asian grocery stores. If that’s not an option for you, health food stores like Whole Foods carries it. As a last resort, you can make it yourself if you have a nice blender, but we’ll save that for another post. This dish is always a treat to me since I rarely get to eat it. It’s also an awesome choice to cook for a group because it’s affordable. You can spend $20 for enough crepes to satisfy 4-5 bellies! Combine all batter ingredients except scallions in a large bowl for at least 3 hours, or overnight. Add scallions only right before making the crêpes. 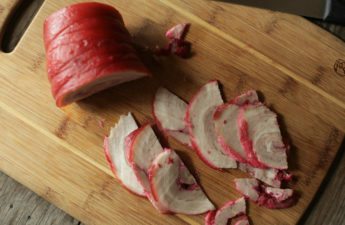 Boil pork until cooked through. Slice thinly. 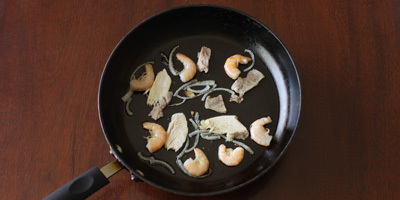 Immediately add a few pieces of pork and shrimp. 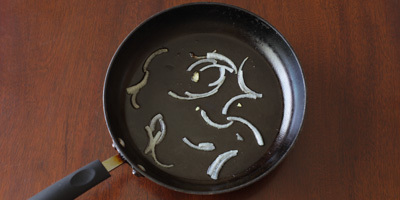 Sauté, lightly mixing until very lightly browned. Pour in some batter and quickly tilt & rotate the pan so the batter is evenly spread. Add more batter if it wasn't enough to cover the pan. 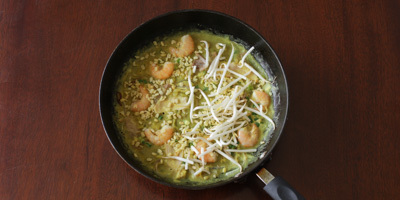 Add some mung beans, bean sprouts, and cover with a lid for 2-3 minutes, or until bean sprouts are slightly cooked. The batter should also be slightly cooked and transparent around the edges. Remove the lid, lower heat to medium and wait for the crêpe to become crisp. 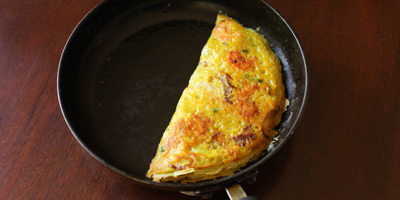 Fold in half, transfer to a plate and serve immediately. 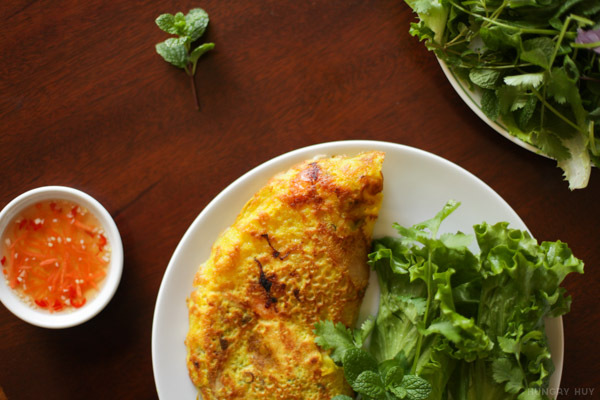 Pork and shrimp work well together and you see it in a lot of Vietnamese cuisine–I could use a few of these crepes myself right now :). Thanks a lot Kathleen! Do you not wrap yours in rice paper when you eat it? I learned that late in life and love it. 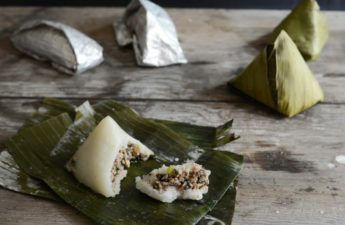 Banh xeo was always messy eating as it fell apart when I dipped it but once I was shown how to wrap it up in rice paper, eating it became much more pleasurable (also the fact that I wasn’t cooking it helped, I’m sure!). Anyway, thanks for such a great recipe! I did ponder pre-cooking the meat–it works if you par-cook it since it will still be cooking for a few minutes after with the batter. Ground meat can be good too, but I guess others like to indulge in the fattier pork belly too. Interesting tip on the rice paper! I’ve never seen it served that way but yeah, banh xeo can be pretty messy haha. I just use more lettuce to keep it together and spoon the sauce on instead of dipping. As always, thanks for sharing! 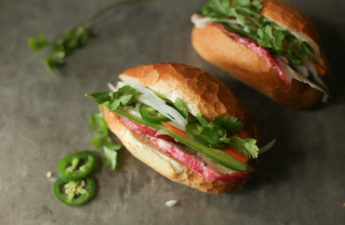 banh xeo, I have just discovered it recently at a restaurant after having seen it on youtube. Now I am hooked but no mung bean for me please :). thanks for the recipe. Wow sorry about that, I’ll update the recipe! It’s for the common 14 oz/400 ml size. 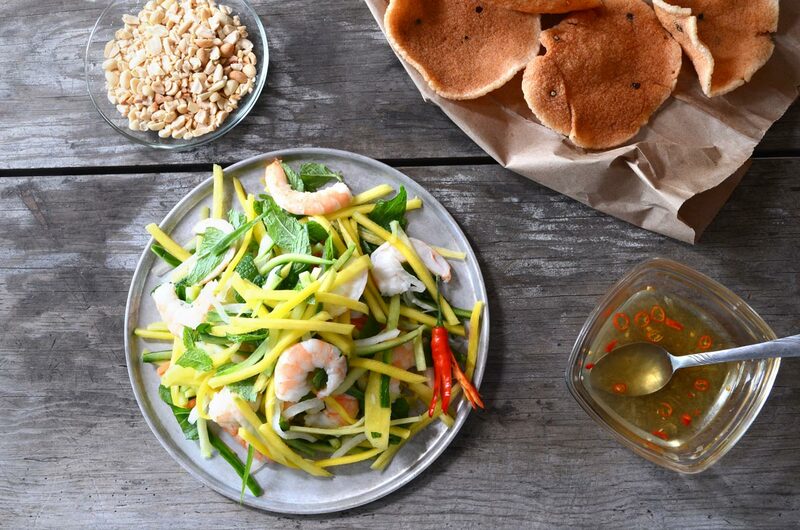 It’s great to see you add mung beans to the Banh Xeo. 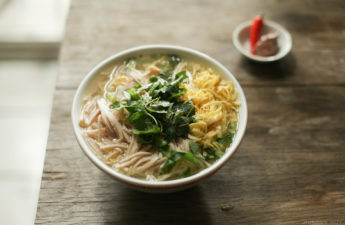 I am Europian in origin but grew up in the Vietnamese centre of Sydney, Australia, and have been eating and loving Vietnamese food all my life. 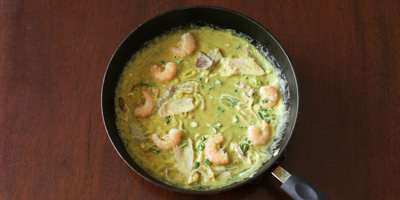 I love yellow mung beans in this dish and was shocked to see most recipes online left them out. Thank you for the great recipe! Hey Kirsty–yeah I agree ya gotta have some mung beans in this dish. Glad you enjoyed the recipe and thanks for reading! 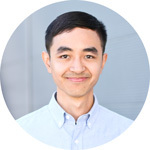 Hello Huy, have you tried using beer instead of water or half beer and half water? With the batter, does it sit 3 hrs uncovered or covered? Thanks! Hey Katelyn! I haven’t tried that yet. It’s pretty crispy as is but if you like a lighter batter it could be worth a shot. I’d cover just so stuff doesn’t fall into it, but it won’t matter too much. Hope that helps!